How can 237 authors converse on eight topics, as one community? Read essays that change thinking and revolutionize discourse. Did I mention that this hot new book’s proceeds all go to charity. Every penny will be sent to Variety, the Children’s Charity. 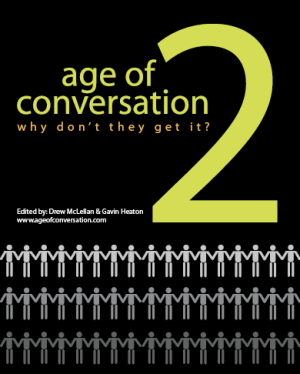 Thanks Gavin Heaton, and thanks Drew McLellan for organizing the Age of Conversation – such a worthwhile project and you two did this all so well! May it come back full circle to bless you and many others who deserve it most. Thanks for the interesting post. It helped me pass the time at work. I will definently visit this site again. Bookmarked! I find it difficult to believe that this has actually happened! It is awesome and I hope to get to read this at some point of time. What an honor to collaborate with you on this worthy project Jeanne, it will be fun to read your chapter! It sure has been busy here too — we seem to hit the ground running. Then a wonderful colleague like you pops in and we smile and pause! Stay well! Thanks for posting the AOC 2 authors’ list and the link to Writer’s Notes! Isn’t it wonderful to be part of such a fantastic project? Sorry I haven’t been by lately. Life can be so hectic at times! I miss our intriguing discussions and hope to have more of them soon! Thank you for getting the word out about AOC2, the most awesome project and book! I look forward to reading your chapter.